The dense cloudy shell of the Venusian atmosphere was for centuries a great barrier to exploring the planet's surface. The first maps of the planet, drawn with the aid of Earth-based telescopes, showed only some vague features. One of the earliest maps was made by the amateur astronomer F. Fonatana in 1645. He thought that he had discovered oceans and continents - which turned out to be an optical illusion. In 1667, G. D. Cassini in Bologna observed Venus and noticed a number of bright nebulous spots. By analysing a series of observations, he estimated the rotation period of Venus to be 23 hours 21 minutes. Later in Paris he was unable to confirm it and his son J. J. Cassini also had no success. Some years later, an astronomer named Francesco Bianchini believed that he had discovered some continents and oceans and he drew maps of the features which he believed he saw. But we have to ascribe all these observations to optical illusions which were very common at this time. The most famous planetary observers of the 18th century were Herschel and Schröter. As a young man, William Herschel moved from his native city of Hannover to England where he constructed the best telescopes of the time and discovered the planet Uranus. Johann Hieronymus Schröter was an amateur astronomer who built an observatory at Lilienthal near Bremen; he noticed some fuzzy dark spots on the bright disk of Venus and believed that he had discovered some high mountain ranges. Herschel disagreed with Schröter's observations of Venusian mountains but he also saw some dark features. Both observers agreed that the visible surface was nothing but a shell of clouds. In 1897 Percival Lowell was convinced that he had discovered some new features on Mars and Venus. He produced his own special map of Venus and rejected the idea of an opaque atmosphere. When photography was introduced to astronomy and led to a large number of new discoveries, scientists were very hopeful that the mysterious cloud-covered surface of Venus might be revealed. But this hope did not materialise; photography was no help. The first good images were produced by F. E. Ross in 1923 at Mount Wilson Observatory. Some mysterious features showed up in ultraviolet light but they were explained as cloudy shapes. Higher quality pictures were produced during the 1950s by G. P. Kuiper at McDonald Observatory in Texas, by N. A. Kozyrev in the Soviet Union and by R. S. Richardson at Mount Wilson. Kuiper and Richardson's photographs showed some vague string-like features. The French astronomers, Boyer and Guérin, observed dark, y-shaped features and calculated a retrograde rotation period of four days, which was later confirmed for the higher clouds. 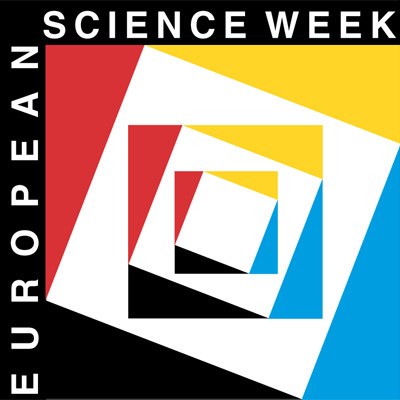 The launch of Sputnik 1 in October 1957 was not only the beginning of the spaceflight era but it also brought about a revolution in planetary research. Missions to Mars and Venus were developed against the background of the race to the Moon. In 1962 the Soviet Union and the United States wanted to demonstrate to the public their growing ability in the field of space exploration. Venus was a fascinating and perfect target. On 12 February 1962, Soviet space engineers launched the first space probe to the Earth's sister planet. On board Venera 1 was a magnetometer for detecting a possible magnetic field in the planet's neighbourhood and sensors to detect ionized particles in the outer parts of its atmosphere. But this first interplanetary space probe was unsuccessful. Communication with the ground station broke down about eight million kilometres away from the Earth and it was not possible to renew it so the fate of this space probe is not known. US space technicians had the opportunity of making history on 22 July 1962 by launching the first successful Venus mission. On board Mariner 1 were instruments which had been originally developed for the Ranger Moon programme. However, the Atlas Agena booster veered off its calculated course and had to be destroyed by a radio command five minutes after launching. But the Americans had constructed a duplicate space-probe and so 36 days later Mariner 2 was launched for the journey to Venus. It encountered Venus on 14 December 1962 at a distance of about 35,000 kilometres above the planet's surface. So Mariner 2 was the first successful planet probe. It found no appreciable magnetic field or radiation belts. A pair of heat-sensing radiometers that scanned the disk of Venus as the probe swept by produced data showing the surface to be dry and scorching hot, a fairly even 425 degrees Celsius over the entire planet. Two additional Mariner probes were sent on fly-by missions past Venus: Mariner 5 in 1967 and Mariner 10 in 1973. 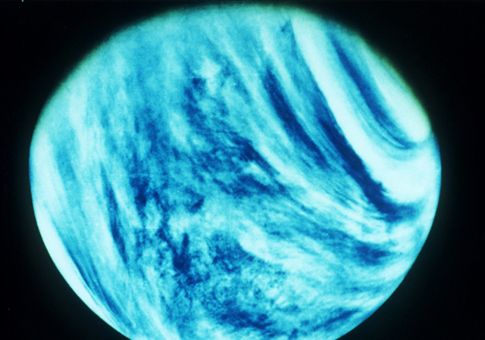 While Mariner 5 provided additional atmospheric data, including proof of atmospheric super-refractivity, Mariner 10 returned the first pictures of Venus . Global coverage in the ultraviolet region of the spectrum started three hours after closest approach and continued for the next eight days to provide a movie of the flow and turbulence in the upper atmosphere of Venus. Mariner 5 was accompanied in flight by the Soviet Venera 4 , launched just two days before it. The Soviets had launched probes at every Venus window since Venera 1 in 1961: three in 1962, two in 1963/64, and three again in 1965. Two of the 1965 probes, Venera 2 and 3 (a TV fly-by and an atmosphere penetrator), both fell silent just before Venus encounter. 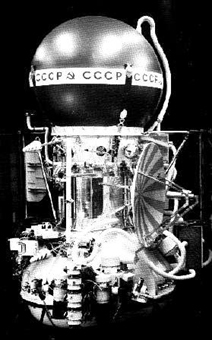 Venera 4 , the only successful launch of a pair in the 1967 window, was aimed directly at Venus. At a distance of 45,000km from the planet it released a one-metre spherical capsule that survived an entry deceleration of up to 300gs. A parachute system then permitted a slow descent through the atmosphere that lasted 94 minutes. But it did not survive on the surface, which has a temperature hot enough to melt lead and an atmospheric pressure 90 times that on Earth. Several more Soviet penetrator missions were conducted. Venera 5 and 6 , launched during the 1969 Venus window, were fitted with smaller parachutes for a faster descent to the surface before being destroyed by heat, but they did not survive long on the surface. They were probably also damaged by the high atmospheric pressure. Venera 7 in 1970 did survive on the surface for a short time and transmitted data, reporting back a pressure of 90 atmospheres at 475 degrees Celsius. Venera 8 was aimed at the day side of Venus and it sent back data for 50 minutes after landing. It survived temperatures of more than 10,000 degrees as it entered Venus' atmosphere. 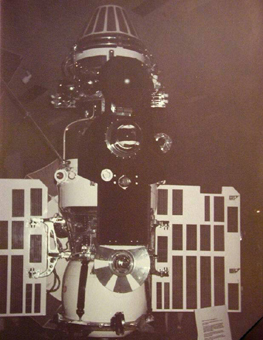 The Soviet Union continued its exploration of Venus in 1975 with two heavy spacecraft Venera 9 and 10 . They each had an orbiter and a landing unit. Two days before encounter, each detached a lander probe, allowing it to continue on to a shallow entry path into Venus' atmosphere. The landing sites were separated by a distance of 2000 kilometres. The capsule of Venera 9 had been built to withstand the extreme pressure of the atmosphere and temperatures up to 2,000 degrees, but it still survived only 65 minutes after landing. It sent back the first pictures of the surface of Venus which was sufficiently bright despite the permanent dense clouds so that no artifical lighting was needed. The rocks had shadows. Venera 10 was also successful in sending back pictures of the surface of Venus. Each single panorama showed a landscape as bright as a cloudy day here on Earth, with features up to 100 metres away clearly visible. The landing sites were like stony deserts lacking both sand and dust, and covered by rocks up to 10 metres across. Venera 11 and 12 which were launched to Venus in 1978 were essentially repeats of the previous missions. They sent back lots of data but no pictures. They found storms with lightning ( Venera 11 counted an average of some 25 strikes per second; Venera 12 a total of nearly 1,000), volcanic activity and only a very small fraction of light actually reaching the surface through the clouds. 1978 marked a veritable invasion of Venus, for the two Russian Veneras were accompanied by two American probes, one of which released four separate landers to collect data on the atmosphere of Venus. 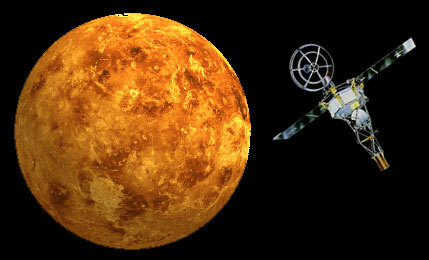 Pioneer-Venus 1 - launched on 20 May 1978 - arrived first, entering an orbit around the planet to conduct a detailed study of near-Venus space and to probe its hidden surface from a 24-hour orbit with a radar system weighing about 11kg. The Pioneer-Venus 2 craft followed on 8 August, releasing four cone-shaped probes some weeks before encounter. To withstand the extreme heat and pressure the probes were constructed of titanium and hermetically sealed. Their windows which allowed measurement of light and heat were constructed of diamond and sapphire. None of these probes was designed to survive the surface crash. All five craft entered the atmosphere of Venus on schedule. The drum-shaped bus (carrier spacecraft) was destroyed as planned as were the four probes. But all transmitted a lot of data up to the point of destruction. One probe survived impact and continued transmitting data for an additional 67 minutes. The orbiter's radar slowly mapped out surface features from above, revealing a giant 3,200 x 1,600 km plateau, 5 km higher than the surrounding area. Elsewhere a huge canyon 1,400 km long, 280 km at the widest part, and 4.6 km deep was found, as well as several old impact craters 600 to 700 km across but only 0.5 km deep. In 1981 the Soviet Union launched Venera 13 and 14 . They found the rocks were similar to Earth's and included basalt. There were high levels of uranium, thorium and potassium in the rocks. They transmitted colour television pictures back to Earth. The landscape appeared yellow as it was illuminated by yellow light. 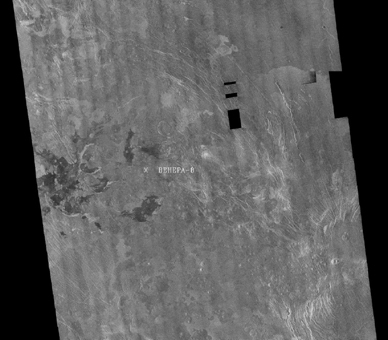 Venera 15 and 16 in 1983, mapped the surface of Venus with radar . This enabled an atlas of Venus to be published. Two-thirds of the surface were found to be hilly and about a quarter is flat lowland. In 1985 Soviet scientists sent spacecraft to Venus on a double mission: Vega 1 and Vega 2 first passed Halley's comet where they took pictures of the comet before going to Venus. There they dropped probes with balloons into the atmosphere to land onto the surface. In 1989, the USA launched the Magellan probe to Venus via the shuttle Atlantis. Using synthetic aperture radar it made the best and most complete maps (about 98% of the planet's surface) in 1990-1994. The resolution of the maps is as high as 100 metres and the elevation was measured with a resolution of 30 metres. Radar mapping revealed canyons, mountains, craters, volcanoes and volcanic formations. The surface of Venus, according to the decision of the IAU, has a feminine nomenclature: goddesses, heroines and other famous women. Maxwell Montes, after the famous physicist James Clerk Maxwell, is an exception. Suggestions for names are welcomed. They must not be political. For more information about methods and techniques of planetary mapping visit the Mercury mapping page and for information on how features on the surfaces of planets and moons are named, visit: http://planetarynames.wr.usgs.gov.